Anaglyphs for 3 dimensional viewing. A stereoscopic picture where the left and right eye images are superimposed, but in different colours. A colour filter over each eye only transmits the image component suitable for that eye and the brain interprets the result in three dimensions. Anaglyphs are unpopular with most stereoscopic photographers, who dislike the poor colour, ghosting and retinal rivalry. 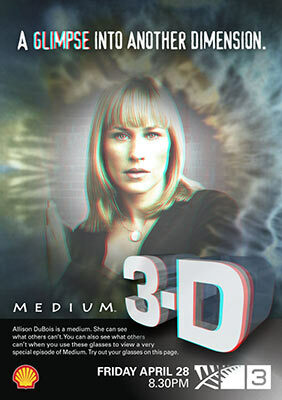 Many people are unable to see Internet 3D unless it is in anaglyph format. This dilemma can only be resolved if stereoscopic photographers forget what is best and struggle with creating anaglyphs, or their audience will be small. Anaglyphs are the cheapest way to project in 3D, using a single digital projector. NASA publishes anaglyphs extensively and so intelligent members of the general public are already used to the format. Children's books often use anaglyphs. There are three main problems with anaglyphs (in addition to stereoscopic errors, discussed separately). These problems are severe enough that many stereoscopic workers avoid anaglyphs, but often they are the only practical way to show 3D to the general population. Ghosting. If some colour from the left image gets into the right eye (and vice versa) a faintly coloured "ghost" will be seen. Increasing the parallax (stereo depth) separates the two images and makes ghosting worse. Retinal rivalry. If the brightness (luminance) of the two images is not the same in each eye, the effect is unpleasant. An abnormal lustre appears in parts of the picture which rival, or it may flicker. The dark eye feels "heavy" or "dull". Some anaglyph glasses have one filter darker than the other (ColorCode and Anachrome). These routinely cause retinal rivalry. As Dmytro Bezsmertnyy says, "You turn into a one eyed pirate." The Pulfrich effect can occur in movies viewed with one dark filter, which may interfere with the true stereoscopic depth. Adapting to the dark colours occurs if you are patient. Sit in a darkened room and leave the coloured glasses on for a while and the 3D images will improve. This is especially important for ColorCode. Wrong colours. There is no hope for getting colours exactly right, because each eye is getting only part of the RGB colour range. Great ingenuity has been expended trying to correct colour problems and modern anaglyphs are much better than older versions, but never perfect. The viewer is always partially colour-blind and/or has retinal rivalry. No optical gymnastics are required (no need to go cross eyed or wall-eyed). Anybody with normal vision can see 3D in an anaglyph. The image covers the whole computer screen, not just half the screen. Spatial and stereoscopic resolution is twice as good as image pairs. Red - Cyan stereoscopic glasses are common and cheap, often coming free with magazines showing 3D. A singe digital projector can show anaglyphs on a screen for a large audience, who see three dimensions through the same, cheap, coloured glasses used for computer or print viewing. This avoids the hassle and expense of two separate projectors as used for polarised viewing. It is necessary to dispense with perfection and learn how to make anaglyphs which do not cause headaches. Nobody said it is easy! Anaglyphs are classified by the colour filters used. Computer monitors use just three primary colours: red, green and blue (RGB). Anaglyph filters are chosen around this RGB limitation. If only two RGB colours are used, the result can only be monochrome. Two colours must get through to at least one eye for a half coloured anaglyph. All three colours must reach at least one eye for anything approaching full colour. 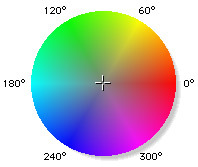 Computer colour displays would ideally show red green and blue without any overlap between colours. Spectral analysis shows practical screens do have cross-talk between the colours. For example, a green phosphor may also emit some red light. If the three RGB phosphors are not emitting their own colour exclusively, it is impossible for any anaglyph glasses to filter the colours precisely. Any filters you use are going to show ghosting. LCD phosphors have less colour cross-talk than CRT monitors. 3 chip LCD projectors often have less colour cross talk than DLP projectors. Careful analysis of anaglyph filters and colour displays is available here. Guglielmo Menegatti has created an anaglyph which needs just one red filter over the left eye, no filter (or a grey filter) on the right eye. Red-Green: R-G. Red filter over the left eye and green right, to match the port and starboard lights on a ship. Monochrome. Less ghosting on computers because the filters do not leak so much. Colenso Advertising flyer for TV3 program "Medium." Art work by Duncan Jones who also describes why the goggles issued by TV3 are not up to standard and how to make your own. Colour anaglyphs (4,5.6) can show true colour when seen without the filters because all three essential colours (RGB) are included. The colour is better where right and left images are accurately superimposed (zero parallax) but there is a coloured fringe where stereoscopic parallax is greater. Red-Cyan: R-GB. Cyan is a mixture of green and blue. Colour anaglyph (but shows red very badly). Gives a bright image which can be seen with low ambient light. Red/Cyan is the most common anaglyph. Full: the red channel only has red information from the left image. Half: the red channel has all colours, it is a grey image coloured red. Lake Wanaka, New Zealand. Hyperstereoscopy. Anaglyphs on this web site are optimised for one of the cheapest card-board goggles available: Red/Cyan anaglyph filters (IYF) from American Paper Optics. Cardboard goggles are hard on the ears, and I mount them in an old spectacle frame. Excellent acrylic filters (which are easier to clean) are mounted in a proper nylon frame from Rainbow Symphony as "Proview." These show more ghosts than IYF, because the filters are not so tightly selective, but leaking means they also show better colour. Colour anaglyph showing red better than red/cyan, but a darker image, with retinal rivalry, unless great care is taken. Invented by Allan Silliphant. ColorCode: RGb-BB. Brown (ochre) left eye, dark blue right eye. Colour anaglyph showing all colours, but a dark image. ColorCode can only be seen well in a dark room, after the eyes have adapted to the darkness. Has the advantage of showing colours well, including red, although not perfectly. There are claims it does not show yellow or blue, but these are symptoms of poor workmanship! Since ColorCode is patented and previously expensive, it is currently uncommon. Sometimes called "Amber-Blue". (Inventor and patent holder: Sven Sorensen, Denmark). View the colour wheel (Apple computer wheel) through your anaglyph goggles to see which colours are transmitted. Note how anaglyph pairs of filters show colours on opposite sides of the colour wheel. They are said to be "balanced" or "complementary"
The bars will clearly show the difference between ColorCode and Red/cyan goggles. Notice how a red filtered eye cannot tell the difference between grey, red, yellow and blue, but does give vague idea about green. The subtle difference between the cyan filter of Mirachrome goggles and standard (Proview) cyan is also revealed. Proview cyan shows very little red while Mirachrome does show red in the cyan filter, but rather dark. A ColourCode© left eye filter (ochre, "yellow") shows red green and yellow, but blue is very dark. These are seen with a red left eye filter and a green right filter. The colours are this way around to match the port and starboard lights on a ship. If you reverse the colours, the result is pseudo-stereoscopy, also called reverse stereopsis. Anaglyphs work well for monochrome stereoscopy, as in the view of Green Lane Hospital. Red/ cyan glasses will also work on a red/green anaglyph, by ignoring the blue component. The aortic aneurysm in 3D is provided in both colour and monochrome anaglyph format, so you can readily see the difference and flip between various 3D versions, using the links provided. The red and blue-green filters may not give perfect channel separation, so that a ghost of the other image is seen. This is a major weakness, which shows up clearly on the anaglyph of a sea-shell x-ray. Ghosting on a CRT screen is reduced by using red/blue rather than red/green, because red and green phosphors have too much cross-talk. Red-Green or Red-Blue only allow monochrome, while the combination of the two (cyan) shows colour - sort of. Some blue filters do pass quite a bit of green and glasses mde with this "leaky blue" show both green and blue almost as well as cyan filters do. The quality of your goggles can be critical. Since screen phosphors can be different, it may be helpful to tune the colour of your goggles to your own monitor. Lee filters have been matched by enthusiasts who make their own goggles. Patents and egos have made filter colours rather confusing, but we amateurs can experiment as we like! magenta / green - produces bad ghosts on computer screens. Left: 179 Chrome Orange, plus 211 neutral density. (The left filter is minus 3 stops to match the extreme darkness of 071 Tokyo blue). According to Owen C Western, this combination may cause even less ghosting than ColorCode©. Roscolene #886 "dark urban blue" on right eye. IYF filters cannot be reproduced exactly because American Paper Optics have the patent on their light cyan colour, with high red rejection and Lee cannot supply it. Most are viewed with a red left eye filter and a cyan right eye filter, but ColorCode uses amber and blue. Red + Green + Blue is enough for human colour vision when all three are presented to one eye simultaneously. This is the basis of RGB computer monitors. If only one of the RGB colours hits your eye, it is converted to grey. If two are available, you see the range between the two colours. Blue and green are seen by the right eye in a red/cyan colour anaglyph, but if you reduce the intensity of the blue channel in the picture, the green gradually turns to grey. Peter Gouras explains the neurophysiology of colour vision, but even while concentrating hard, you (like me) may have difficulty remembering it! Human eyes see colour quite differently from a camera and after seeing the influence of the brain, it may dawn on you why getting white balance compensation correct when taking photographs is so important. Our retina / brain wiring allows for different colour light sources. Film cameras cannot compensate without filters and digital cameras need electronic help from "AWB" (Automatic White Balance). AWB can be fooled, so "CWB" is available on better cameras (Custom White Balance). Cyan is white (or grey) light minus red. The background here is grey and type is white to avoid causing colour confusion from colour contrast effects. Working in image processing programs, you should have a grey, white or black background before making colour comparisons. View through your anaglyph glasses. Close one eye and then the other to see red turn white or grey and cyan turn dark blue. The ghost images turn deep red/brown and deep blue (Anachrome) or lighter blue (Proview). The left eye (red) sees shades of grey. It becomes the parallax detector for 3D. It makes sense to include the full monochrome luminosity range in the red part of the anaglyph, since it will not be seen in colour and you want good balance with the green and blue luminosities, to reduce ghosts. The amount of green and blue in the monochrome image can be varied to reach the desired result, as described in "how to make anaglyphs" later. Colour perception in the two eyes is linked, contrary to the simplified explanation given above. If the left eye sees a grey image and the right a full colour image, the result is like a half colour anaglyph. If the left eye sees a grey image, displayed as red and the right eye a full colour image, the result is a full colour image. Images are worth a thousand words and this complex description is illustrated here. It is possible to convert red to other colours in the blue-green range. For example your red flowers can become blue flowers. This is done in Photoshop by taking the right eye red channel and combining or replacing into the right blue or green channel. You can colour mix most simply, to any intensity you like, by using the channel mixer. In this way red can look completely blue or anything in between (shades of purple). You can even add half red to green and half to blue - experiment! These interesting conversions are available in the ingenious French program, Anabuilder and also in StereoPhotoMaker (SPM). Colour anaglyphs are satisfactory for muted colours, such as forests, but are unconvincing for red . Scenes which avoid red can be remarkably close to real colour, as in the Rawene water-front and the Manapouri Power Station. The Qantas jumbo jet shows red quite well but it gets a strange sheen through the red/cyan glasses. (Lustre: one eye seeing a different luminosity from the other. Also called retinal rivalry). (Some rods in the retina are said to be yellow sensitive. Most rods cover the visible range, but are more sensitive for green and rather insensitive for red. It is doubtful if these two different rods actually contribute to colour vision. Cones are inactive in the dark and night vision from rods is monochromatic). 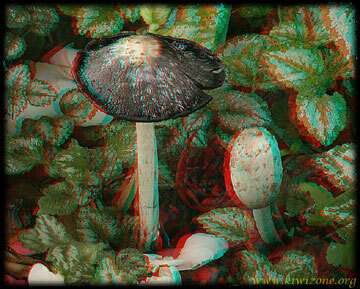 The page background anaglyph, of a bird's nest fungus, shows brown quite well The red channel was brightened considerably (at low contrast, to avoid too much ghosting) and red has penetrated the cyan filter enough to allow it to influence the colour impression. Experiments like these are worth-while for improving the colour rendition of anaglyphs. Colour anaglyphs can show perfect colour in places where the two images are in register, but only when viewed without the red/cyan glasses. Example: the large Kauri grove anaglyph. Further away from the plane of registration, the colours separate. An anaglyph of Doubtful Sound shows how green bush is represented well, because there is no red to confuse the issue. Fox Glacier anaglyph shows how white ice and snow makes an almost acceptable colour anaglyph. There is retinal rivalry, because the red channel is too bright and this anaglyph experiment will have to be repeated - when time allows! Anaglyph colours for printing inks and computer phosphors have been experimented with until commercial systems are now available giving nearly correct colour. Anachrome glasses allow some red through in the cyan channel on purpose, to improve red depiction. The red filter is extra dense to reduce cyan ghosting and retinal rivalry. Enhancing red while creating the anaglyph makes the left eye image brighter. The dark red filter helps reduce the retinal rivalry caused by that luminosity imbalance. Stereo depth is reduced (using 1/60 instead of 1/30 as the stereo base). This makes the anaglyph closer to true colour when seen without goggles, because cyan and red are not separated so far apart and superimpose better. It also reduces ghosting, because the two colour channels are close together. Ghosting is worse with wide stereo separation. 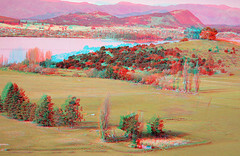 Anaglyphs made with reduced stereo base look quite good even without the red/cyan goggles. Some areas that really should be red can have red enhanced (lip-stick for example). To leak red and yet prevent ghosting it is necessary to have the red and cyan images pretty nearly in register, so you can only get bright red at one stereoscopic depth. This is helped by reducing stereo base to 1/60. Unfortunately this trick can cause window violations (wv - see later). Increasing the red channel brightness can produce fairly convincing red, but at the cost of retinal rivalry. The left (red) eye sees things too bright while the right (cyan eye) is darker. That is part of the secret of Anachrome glasses - they overcome the retinal rivalry after red is enhanced, by having an extra-dark red filter. The problem is: anaglyphs not made with Anachrome viewing in mind are too dark for the left eye. Anachrome balanced anaglyphs are capable of showing red, especially if the cyan channel is darkened in the red area and the red channel is lightened a bit. Lightening the red channel increases red ghosting, so it is better to lighten the bit you want red and selectively burn the red ghosts in Photoshop to make them darker and less obvious. You have to be careful with this because it also spoils the 3D depiction at edges. Here is a Feijoa flower, which is crimson. The anaglyph does not show crimson but does have fairly convincing red. "Ordinary" (Proview) anaglyph glasses will show retinal rivalry, while Anachrome glasses are not so bad. BUT these comments only apply to anaglyphs made specifically for the Anachrome system. These tricks are being used with gradually improving results for orchid anaglyphs on this web site. For example: Nematoceras "Pollok" Proview shows the red but has rather severe cyan ghosting on this example. Comparing Proview with Anachrome glasses, Anachrome is better at removing green ghosts because it has a darker red filter. Proview is slightly better at removing red ghosts, because the cyan filter lets less red through. Mirachrome is the same as Anachrome but is slightly sharper in the red channel on a computer screen because it has a weak positive lens incorporated with the red filter. It corrects for chromatic aberration between red and blue in human eyes. The difference between various red/cyan goggles is marginal. Nothing is going to make an anaglyph perfect! However if you want to show red you need Anachrome goggles and the anaglyph has to be specially balanced for those goggles. If you want minimal ghosts, try IYF filters and accept that your images will be severely colour-blind. You will have no trouble with a broad-band connection, but if the pictures stall during down-loading on a dial-up connection, press refresh on your browser. Anaglyphs are large files, because if they are jpeg compressed too much, colour distortion spoils the 3d effect. Anaglyphs are better as .png files, but those are nearly as big as .tiff files, so are no good on the web. Coprinus comatus (shaggy ink-cap fungus) growing under a camellia bush, which has dropped some red flowers. Red can only be rendered as brown, at best, in a red/cyan anaglyph. The red flower is very dark in the cyan channel, but bright in the red channel. This causes retinal rivalry between the two eyes, which is annoying to most people. Red can be changed to any colour on the green-blue range, even purple, but it cannot be seen as red. Here the red flower is changed to blue. The colour is wrong but you decide if the anaglyph looks better. In astronomical anaglyphs, red is an important colour (H alpha), but it has to be changed to grey, or in this example of a 3D nebula: purple. The original photographs were taken through a red filter, which accentuated the clouds, then converted to a sepia-toned, monochrome anaglyph. Some people find the trees coming through the window disturbing, do you? Hyperstereoscopy has brought Mt Eden closer than it really is and rendered it in 3D, although it is too far away to be seen in 3D with normal eyes. You can see Mt Eden is sitting in front of the clouds. Does this enhanced reality worry you? Traditional stereo workers who love "orthostereoscopy" have been heard to object. An animal with no red makes a good subject for red/cyan anaglyph and comes out in almost true colour. Click here for a bigger version and links to more information on this famous New Zealand animal. The back-ground image on this page is an anaglyph of Crucibulum laeve, which is remarkably close to true colour. Brown is a "shoulder colour," as Alan Silliphant of Anachrome is fond of writing in his emails to me, but it comes out well on anaglyphs.